CEO Anna Maria Chávez Takes Part in Panel on Women and Leadership in Washington, D.C.
Anna Maria Chávez, chief executive officer of Girl Scouts of the USA, is in Washington, D.C., for presidential inauguration festivities. On Friday, she took part in a Women's Leadership Roundtable panel discussion hosted by the United States Office of Personnel Management. 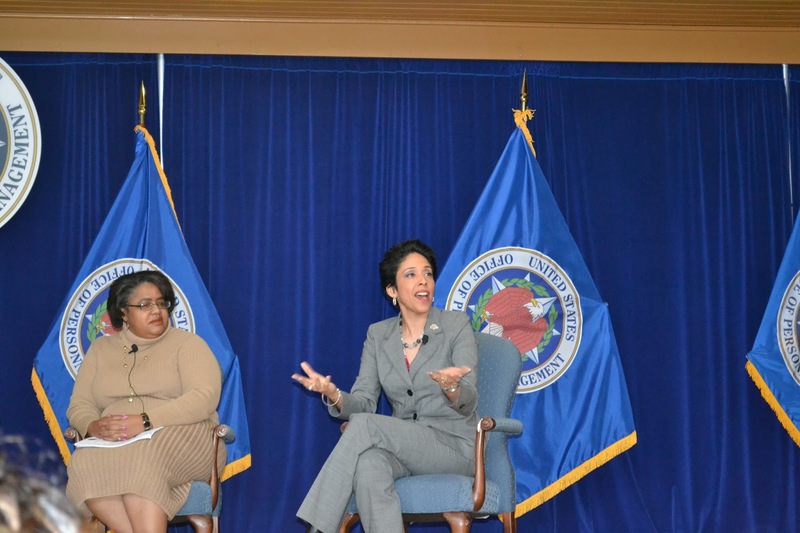 The panelists explored ways to increase women in public leadership positions. The wide-ranging conversation was moderated by Newsweek columnist Eleanor Clift and along with Anna featured an address by Tina Tchen, assistant to the President and Chief of Staff to the First Lady of the United States, U.S. Rep. Kyrsten Sinema from Arizona's 9th Congressional District; and Rhea Suh, Assistant Secretary for Policy, Management and Budget at the U.S. Department of the Interior. The event was held in the Campbell Auditorium of the Theodore Roosevelt Building, where the Office of Personnel Management is headquartered.